Website Traffic - Big in Japan? I enjoyed the opportunity to get an 80's music reference into the blog title. With reference to the performance at Kirby on Thursday, as widely predicted, my trusty old straight-talking chess critic Fritz showed that I blew a winning position in grand style. At move 7 it suggest d7-d5 "and Black can already relax". I, of course, played d7-d6. Notwithstanding that, at move 20 my coefficient was about 6. At move 30, it was about 3, at 40 we were level, and I resigned on move 47. I would like to say I was feeling sorry for my opponent, as he'd had a bit of a car shunt earlier in the day, but the truth is I WAS RUBBISH. As I told Colin on the way back, I'm thinking about taking up bowls, as they seem to have nice badges, and there might be the possibility I might not be so terrible at that. Before the match, both sides had been keen, and had agreed, to play five boards. On the night, however, we arrived with six. This was fine. Kirby nominated the next person to walk through the door as a new board 1. It was Jim Cowley. Everybody else moved down a board. The first result was a welcome win for Michael against Scott Turner. If memory serves - i think Michael lost to Scott at the Heathcote Arms last time they met. At this point, in the remaining games we were looking alright: Gordon was a rook up on board 3, Haka Dave was a piece up on board 2, Drew on board 5 was a piece down but still kicking and i think Gary was slightly down on material on board 4. On board 1, there was material parity, but I thought i had a slight edge in position. Drew then lost, and this was quickly followed by a loss for Gary. The rest of us played on for a while only to see some decent positions dissolve. Gordon lost his additional material and then the game. Dave had two rooks against rook and bishop and a passed pawn that could only be stopped by sacrificing material. As usual, i had met the time control with seconds to spare and my 30th move needlessly dropped a pawn. Things went downhill from there. Kirby Muxloe 2 win matches only slightly more often than we do, so they asked us to leave so that they could celebrate by dancing naked around the Christmas Tree. I don't think that they were joking. At Christmas, the Division 5 table looks like this. Our next League matches are as follows: HA2 plays at home against Leicester University 1 on Tuesday 10th January; HA3 plays away against Ashby 4 on Thursday 12th January; HA1 plays away against Willowbrook 2 on Thursday 19th January. Our next Cup matches both take place against Braunstone and both take place on Tuesday 24th January. HA1 play at home against Braunstone 1,and HA3 play away against Braunstone 2. I am not sure if there will be much of a club night on Tuesday 20th December, but i will be up there at 7.30 if anyone wants a friendly. There will not be a club night on Tuesday 27th, but i suspect that by Tuesday 3rd January we will all be itching for a game. Rob and John came to the 1st team's rescue on Wednesday, when Graham and Raj couldn't make the match. Unfortunately (or fortunately depending on your point of view), their opponents didn't put up much resistance and both won quite easily. John had managed to take both rooks off of their original squares by the 12th move!! 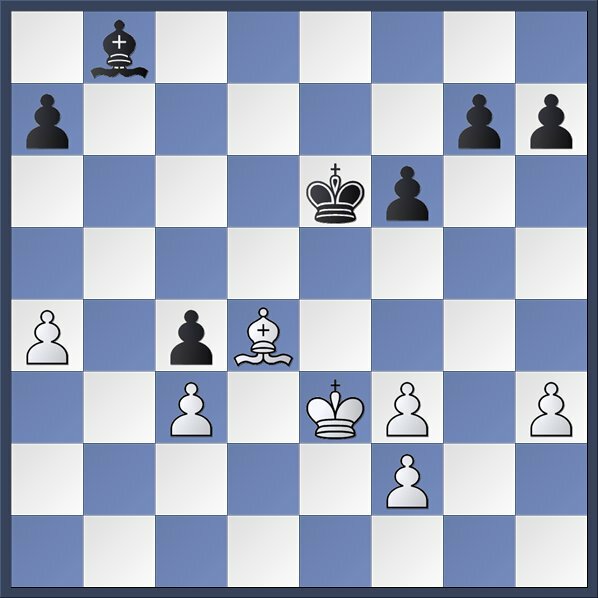 Dave survived a scare against Jim Miller, who launched an attack against h2 with Bishop and queen, which resulted in him being 2 pawns up. Thought he was only going to stay 1 pawn up and offered a draw which Dave accepted and then realized the move Jim had just made was a blunder - so a draw was probably a fair result. Mike's game fizzled out to a draw when Mike realized he could take a draw to give us the match. I didn't play the opening very well, but managed to nick a pawn somewhere and was a pawn up in a queen and pawn ending. Terry offered me a draw, which I turned down knowing I couldn't lose, but I let my time drift away and had to settle for the draw in a won position. I put Dave, Mike and my poor opening play down to the fact we spent 15 mins driving round Loughborough trying to park!! This puts us 2 points clear at the top of Div 2 going into the Christmas break. Let's hope that lightning doesn't strike twice. We were top of Div 1 at Christmas last year and never won another match!! Had to play in the alley and at 7.15 we had no heat! The landlord rallied round and set the fire and after a while it was warm as toast! Rob came off worst against Howard and the Albin Counter Gambit. John drew and Ray lost, but i didn't see anything of their games. I was up against it all game, I decided to offer Peter a draw and made a total blunder with the move, but then found a way out with a perpetual that if he didnt take was curtains. So HA2 lose another one! Over the last year, interest in our website seems to have grown. Recently, we have been having 500+ hits per month, and for November we had around 850 hits. Not bad for a chess club with fewer than 20 players. It would be interesting to know who visits us. If any of our readers out there want to submit a guest blog, then e-mail it to me and i will put it up on Boxing Day. Well done to absolutely no one. p.s. Something weird has happened on the LRCA website to the HA2 / University result from last Thursday. The match took place, and the result was late appearing - and now it has disappeared again. When it returns, we will post something here. Next week: HA2 at home to Hinckley on Tuesday, HA1 away at Loughborough on Wednesday, and HA3 away at Kirby Muxloe on Thursday. Gary was the first to finish. His opponent laughed out loud before unleashing a knight attack on Gary's queen whilst discovering a queen and bishop mate in one along the long diagonal. Five minutes later, in a return friendly, Gary had his revenge as he removed a queen for free whilst discovering check. This prompted an immediate resignation. Michael and Drew were both fine in the openings, but went on to be outplayed in the middlegame. My own game had been looking drawish for a while. I had black. We were down to pawns and same coloured bishops with Barry having a pair of isolated double pawns. When we got to the time control Barry offered me a draw. Being only slightly better, and the match being lost, i took it. I did not see any of the HA1 match, but there looks to have been a straightforward win for the home team. HA2 Vs Latimer 1, and HA3 Vs Syston 4 both at home on Tuesday. I will be contacting people for their availabilities. Blaby District Chess Club at the Heathcote Arms is the friendliest chess club in Leicestershire. We are also one only a few local chess clubs that plays its home matches in a pub. Formerly known as Littlethorpe Chess Club, we moved to our current venue, in Croft, in Spring 2009. In the 2016/17 season, we are running three teams of different strengths in the Leicestershire league. We welcome new players of all standards to the club (and we really mean that) ; so whether you are new to the area or thinking about pushing those pieces after taking a break - we would be happy to see you! For more information or a chat please call Peter the President (?????????) or John (????????) or pop along to The Heathcote Arms in Croft any Tuesday evening. We are there from 7.30pm and a warm welcome is guaranteed whether you're a new member, an old friend or just visiting.